1. San Francisco Chronicle advertising information (below), reservation deadline January 27 and publish date of Sunday, February 5. 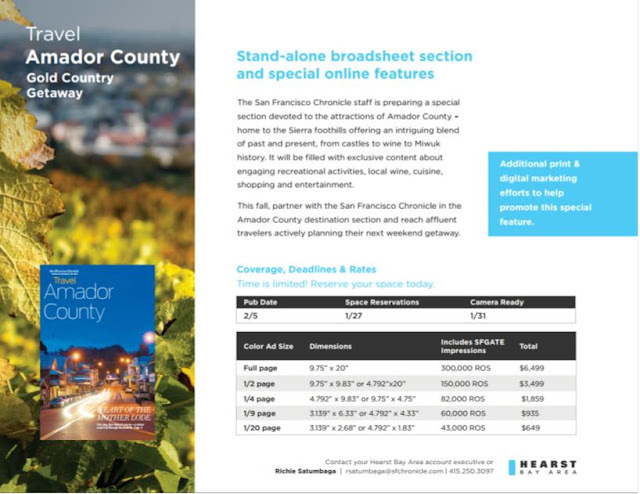 These inserts have been instrumental in raising awareness of Amador and the online component of SFGate adds even more audience. Please contact Richie Satumbaga, rsatumbaga@sfchronicle.com , 415-250-3097. 2. January Agenda for our first board meeting of the year (below), Thursday January 12, 9 am, Jackson Rancheria Casino Resort’s hotel conference room. Please do arrive a bit early to enjoy a light breakfast and hot beverage, generously provided by JRCR. We can catch up before the meeting on what’s new. Please note that the agenda includes the meeting schedule for 2017. All are welcome to attend. We will be reprinting our Visitor Guide in early 2017. Details will be coming out later this month. Please do not hesitate to contact me via email, maureenfunk@volcano.net, or cell phone, 209-969-5065, if you want to learn more about Amador Tourism activities. Your knowledge strengthens all of us. We also love to sell tickets for your events, list your events on visitamador.com, set up itineraries for media or visiting groups, and assess advertising opportunities that come your way. We are Amador’s Destination Marketing Organization and if we don’t have an answer for you, we have many resources available to get an answer. 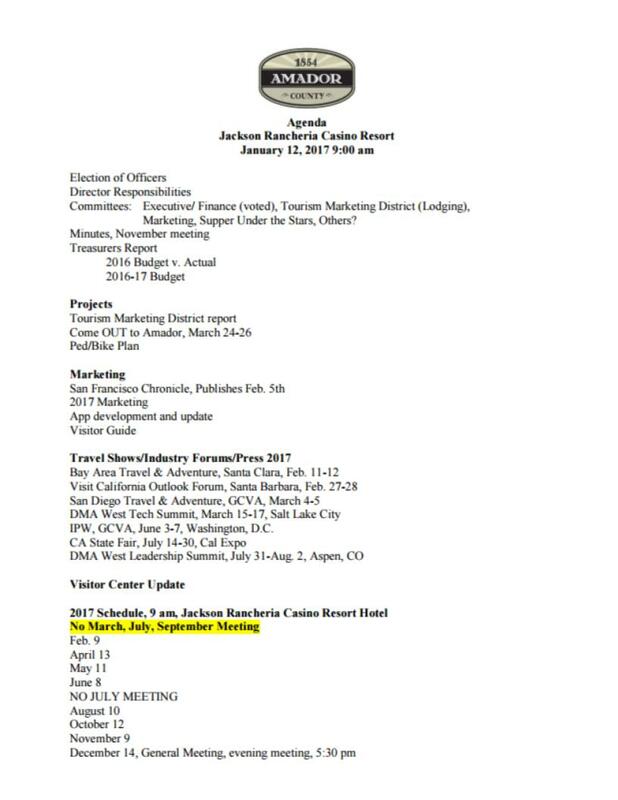 I thank you for the opportunity to serve as Amador Council of Tourism’s Executive Director. I wish you a prosperous and joy-filled New Year.